What is the Occupational Outlook Handbook (OOH)? 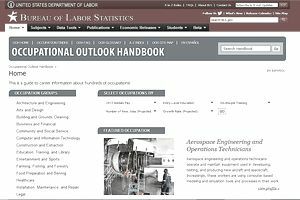 The Occupational Outlook Handbook is a career guide provided by the U.S. Government's Bureau of Labor Statistics (BLS). It provides information on a wide range of occupations. For each profession, it describes what workers do on the job, working conditions, required training and education, earnings, and expected job prospects. The Bureau of Labor Statistics is the main fact-finding agency for the federal government in the broad field of labor economics and statistics. The BLS is an independent national statistical agency that collects, processes, analyzes, and disseminates essential statistical data to the American public, the U.S. Congress, other federal agencies, state and local governments, and business and labor. The BLS also serves as a statistical resource to the Department of Labor. BLS data must satisfy a number of criteria, including relevance to current social and economic issues, timeliness in reflecting today’s rapidly changing economic conditions, consistent accuracy and high statistical quality, and impartiality in both subject matter and presentation. Sometimes just seeing the name of an occupation sparks an interest in further exploring the field. Use the Occupational Outlook Handbook A–Z Index to browse a list of all the occupations in the OOH and then conduct in-depth research by reviewing the detailed descriptions of occupations which sound appealing. The BLS organizes information about occupations into 25 major groups. Users can scan groups that seem related to their interests and find lists of specific jobs related to the group in order to investigate options. There are 25 occupational clusters in the OOH, including architecture and engineering; arts and design; community and social service management; computer and information technology; construction and extraction; education, training, and library; entertainment and sports; farming, fishing, and forestry; food preparation and serving; healthcare; installation, maintenance, and repair; legal; life, physical, and social sciences; management; math; media and communication; military; office and administrative support; personal care and service; production; protective service; sales; and transportation and material moving. The Bureau of Labor Statistics publishes a table of Fastest growing occupations with the expected highest percentage change of employment from 2016–2026, produced by the Employment Projections program. Rapidly expanding fields like wind turbine service technicians, solar installers, home health aides, physician assistants, and nurse practitioners, are listed. View a list of the jobs with the highest projected numeric change in employment from 2016–2026. The list includes personal care aides, registered nurses, food preparation and service workers, home health aides, software developers, operations managers, and more. Click on the highest paying occupations tab to generate a list of 20 occupations with the highest median annual income, including oral surgeons, anesthesiologists, psychiatrists, orthodontists, airline pilots, judges, petroleum engineers, computer and information systems managers, and more. The Occupation Finder allows you to filter a list of occupations by combining any of five factors: median pay level, level of education, availability of on-the-job training, projected level of new jobs, and projected level of growth. For example, a search by bachelor’s degree with no on-the-job training, projected number of new jobs between 10,000 and 49,000 with faster than average growth and median pay between $35,000 and $55,000 yielded a list of occupations including meeting convention and event planners; interpreters and translators; child, family, and school social workers; community and social service specialist; and education, training, and library workers. The most valuable source of information on the site is the detailed descriptions of the jobs which you identify by the search options referenced above. For each occupation the OOH provides a helpful summary of the job with brief references to median pay, education required, work experience required, on the job training, number of jobs, job outlook, and projected change in employment from 2016–26. Look at the description of a Registered Nurse as an example. You can drill down to get more detailed information about what nurses actually do on the job including the specific types of tasks which are carried out. The work environment is detailed including the types of employers where one might work and the stresses encountered through the job. The process of how to become a worker in the field including education, licenses, and important qualities for workers is cited. Detailed information about the average pay and range of pay, including the top 10% and bottom 10%, is listed along with pay differences within various occupational settings within the field. The job outlook is presented with information about trends impacting the availability of jobs and areas with the best job prospects. Similar occupations are referenced to help you to explore related jobs as you refine your career goals.